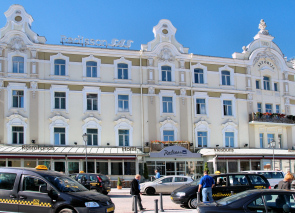 Radisson SAS Astorija Hotel in Vilnius is one of the largest in town and is also a part of the International Radison SAS Hotel chain. This business - class hotel stands in the heart of the Old Town within walking distance of the main tourist attractions, cafes and designer shops. 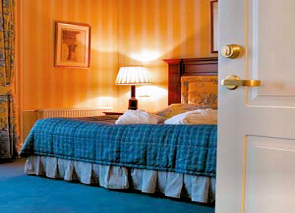 (Photo left standard room)All rooms are decorated in classical style. The Radisson SAS Astorija Hotel in Vilnius has more than 120 well-appointed rooms including business class rooms and suites. They also offer non-smoking rooms, non-allergic rooms and rooms for disabled guests (upon request). You will find all the amenities you would expect of a first class hotel. Every room has a safety deposit box, tea and coffee kit, iron and trouser press, heated floors, individual climate control, free Internet access, pay television and more. Hotel services include 24-hour front desk, luggage storage, 3-hour express laundry, express check-out and late check-in, which is ideal for travellers who have a late evening arrival flight. Also babysitting, currency exchange, business centre and car rental. The hotel also offers a bar with a pleasant veranda, which is a lovely spot to meet up with friends or observe the bustling Old Town. The hotel’s health club is a great attraction which offers plenty of leisure activities including indoor pool, fitness room, sauna, steam bath, Jacuzzi and whirlpool, massage. Public parking is possible on site and costs 10 € per day. If you wish to read other people’s reviews who stayed at the Radisson SAS Astorija Hotel, check out room rates and available booking dates, click on the link below.